Supporting the work of PPS Local School Foundations and the PPS Parent Fund is made easy through New Seasons Market’s innovative Cans for Kids program. Step 1: Collect your redeemable cans and bottles (at home, at work, at school). As of January 1, 2018, the beverage bottle redemption list has expanded to include things like juice, hard cider, energy and sports drinks, iced tea, iced coffee, kombucha, ready-to-use mixers (such as margarita mix), smoothies, protein shakes, nonalcoholic wine, nutritional supplements, kombucha and coconut water. 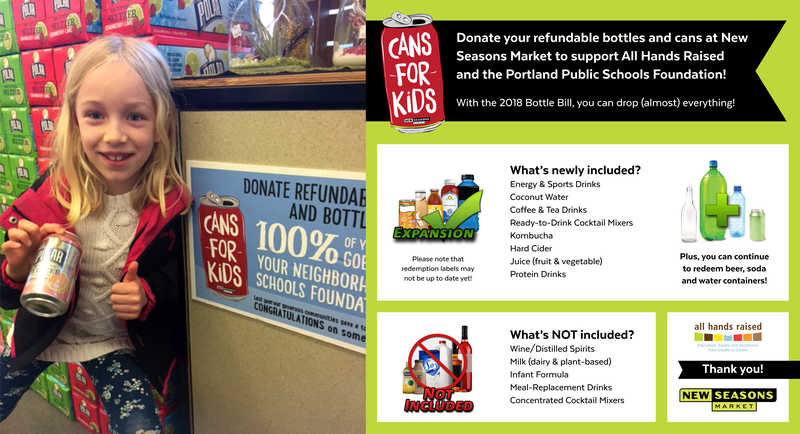 Step 2: Bring your cans and bottles to any Portland New Seasons Market store and give them to a cashier, or in most locations place them in the Cans for Kids bin located in the front of the store. Step 3: Feel good that the redemption from those cans and bottles will go directly to support PPS schools and students! One-hundred percent of net parent-raised funds through PPS Local School Foundations benefit PPS students and schools due in large part to the historic and significant contributions from New Seasons Market through the Cans for Kids program. All Hands Raised does not keep a single dollar of any of the money raised by PPS parents, including for operating expenses. Since 1994, All Hands Raised has supported the work of PPS parents to raise critical funding for teaching and staff positions in PPS schools and managed the innovative and impactful PPS Parent Fund. Learn more about the PPS Parent Fund here. Still not sure what’s redeemable? Learn more about the 2018 Bottle Bill here!